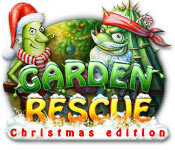 Garden Rescue: Christmas Edition is rated 4.9 out of 5 by 26. Rated 5 out of 5 by Dbzmaster1213 from Garden Rescue Sequel is Amazing! This second Garden rescue game is even better than the first! While maintaing the great things about the original game it adds lots of new fun things such as: 30 All-new Levels! New music! New Special items! A fun-filled christmas theme that makes the game twice as enjoyable! With snow flying by and christmas trees to defend how could anyone resist buying this excellent new game! Hoping to see other Garden Rescues in the future! Rated 5 out of 5 by Lucy_Patrick from Totally addictive!!! Wow, love this game, can't stop playing it and there are so many levels!! I have played every level but not got 3 stars on all the lowest levels yet so hours and hours of fun!! If you've got a lot to do before Christmas I recommend you wait to try this until after Christmas, you won't finish what you need to otherwise lol. Rated 5 out of 5 by CasualGamePlayer from Festive Fun This is the Christmas version of the Garden Rescue tower defence/ strategy game. The game developers haven’t reinvented the wheel with this game, just put a festive spin on the game with a few tweaks here and there to make things interesting. I especially love the coin collecting system that they have implemented - great improvement. The graphics are bright and cheery, music fitting the seasonal theme and the festive costumes the bugs/attackers wear are fun. For those that are new to the Garden Rescue game or new to tower defence/strategy games in general this is a good game to start as there is a good tutorial guide. Loads of achievements to collect and upgrades and prizes too. If you are in the mood for a bit of holiday fun then give this game a try. Rated 5 out of 5 by avril425 from Fun and Addictive I like the first Garden Rescue well enough and I really think this one keeps up to the same standards. It is just cuter. The bugs in their winter clothes is funny. It is a good game for all ages, kids and adults. The music wasn't annoying like it sometime can be in some arcade games. I will put this on my list of must have games. Rated 5 out of 5 by SilverBranch from Better than the first - and that's saying something! I loved the first Garden Rescue game despite the fact that I'm not much of an arcade game fan. This one is even better. It's strategy and "time-management" oriented like the first and plays very much the same. However, there are new bonuses in this version that are great improvements over the first game in the series. Fun and addictive! It's a buy for me. Rated 5 out of 5 by lorwynmoon from Havent played the first Didn't play the first one but thought I'd try this. If you enjoy Tower Defense/Strategy Games then you'll probably like this. I tried it solely on the fact that it is Tower Defense and loved it. Around lvl 9 is when it actually starts to get challenging but I will probably buy it after my 1 hour is up. Rated 5 out of 5 by alinarouge from Great fun! But simpler than the first one. Rated 5 out of 5 by Pearly11 from Tower Defense Winter Version This is a tower defense game in which you have to defend your Christmas Trees from an onslaught of bugs. Lots of levels (sorry, forgot to count them and my free trial has just finished, so I can't go back) with increasing difficulty. In a nutshell this game is the same then its prequel "Garden Rescue". The layout of the levels are slightly different, Some of the bugs in the winter edition wear knitted woolly clothes which is really cute and I have observed that the ones wearing knit wear are slightly stronger than the ones who take the brunt of the freezing conditions. 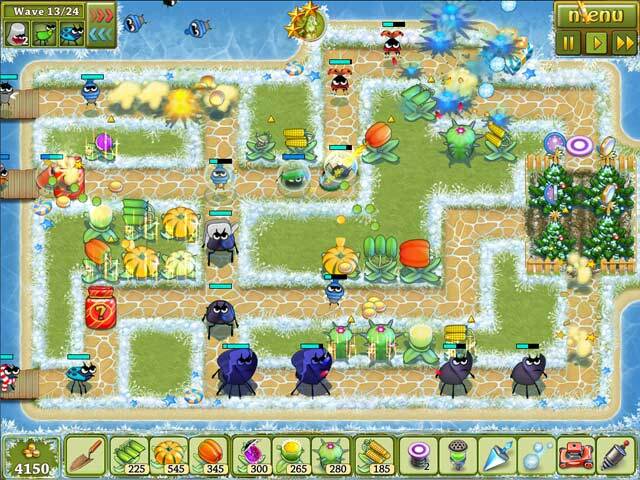 The game really is great fun, but optically nothing much has changed, apart from that you know defend Christmas Trees instead of strawberries, some of the bugs come dressed and landscape is a winter scene with snow and ice. The music is exactly the same than in Garden Rescue and I really think it is a shame that the developers didn't make the effort to treat the player to some Jingle Bells. After all they called it 'Christmas Edition' themselves. So I think this would have been a nice touch. Don't expect lots of action. This is a tower defense game and all you do is to strategically place weapons, which are also exactly the same than in the first game (corn shooter, pea shooter etc). After that you watch and observe to see if your tactic works and if it doesn't you have the opportunity to intervene by adding a weapon or some of the traps you can collect along the way. I am not yet sure if I will buy this edition, because I already own the first one and this is purely down to the lack of effort to make this edition a touch more Christmassy by using more appropriate music and changing the weapons to e.g. needle spitting pine cones and snowball throwing elves. However, I did rate it five out five on everything, because it is a great tower defense game whether or not it meets my expectations regarding music and weapons. I can highly recommend it but try before you buy, especially if you never played a game from this genre. A Happy Christmas 2012 and a great New Year to everybody. Rated 5 out of 5 by AndThenAgain from Great Defense Game I own the first version of this game and loved it so I was pretty sure I'd like this version also. It is mostly the same with small differences such as the fact that you are protecting Christmas trees rather than strawberries and some of the bugs have winter themed protection. That is also the entirety of the storyline, (protect your trees!) which is why I only gave it 2 stars. The game has 3 different levels of difficulty which I really like. I also really like that it is not just mindless clicking. One level I had to restart 3 times before I figured out the best way for me to place my plants. All in all I think this is a great, fun game that kids and adults will enjoy. 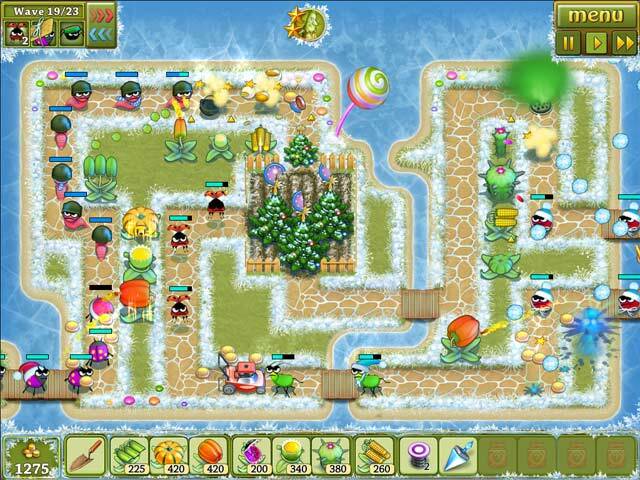 Rated 5 out of 5 by rule62 from A Great Game If you enjoyed the original "Garden Rescue" then odds are that you'll enjoy "Garden Rescue: The Christmas Edition" as well -- if not more so. The little pests in their winter garb (scarfs, knit caps, sweaters, etc.) are a hoot. Although the game layouts, music and tactics are similar to the original version, there are plenty of new additions such as mouse-over coin pickups, and several new "booby-traps" and such. Both the original game and the new Christmas edition are basically tower defense games, so if you enjoy that genre then you ought to at least give this game a try. The three levels of difficulty available means that everyone from the novice to expert can find this game to be an enjoyable and challenging experience. 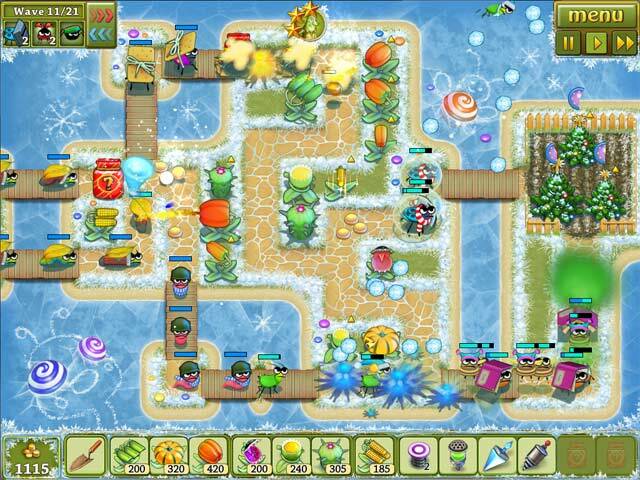 Folks who like their games to be more on the serious side will probably find this game to be too silly -- but if you don't mind some silliness and humor, and you enjoy the tower defense format, then I suspect you will thoroughly enjoy "Garden Rescue: The Christmas Edition." Rated 4 out of 5 by scooter0327 from Yay! Tower Defense Sequel I really love tower defense/strategy games, so I was glad to see this one. Thoroughly enjoyed the original, so I was glad to see a new version. Very similar to the first, but with some added bombs and such. Colorful, cute graphics, but the music can get a bit redundant (read annoying). You will want to play with the sound on, however, as it's a great clue as to picking up coins. Missed coins several times at first til I turned it up a bit (coins disappear after a time). Great level of challenge. You can choose from 3 difficulties and further challenge yourself to get 3 stars on each level. Seems like there are only 30 levels, but with the difficulty levels, you can certainly get your money's worth out of it. It was definitely a must buy at the Daily Deal price! Please BFG, make more of these types of games! Rated 3 out of 5 by nuvolaco from I (almost) love it!!! I (almost) love it!!! On level 3 I got my first Trophy, The Stubborn Trophy for trying a level 10 times. And I gave it up. Winter came, but that won’t stop wily beetles that are hungry for vengeance! Stop them from ruining Christmas for the garden dwellers!